Back a few years ago when I was still flying airshows, I received a call from a political party in Puerto Rico. They said they wanted to hire an airshow pilot with a smoky, noisy airplane to help with their political campaign. 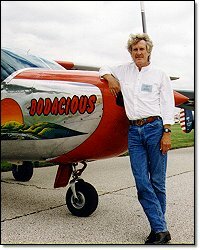 Since most of the performer's aircraft lacked the range to fly that far, and my smoky, noisy Cessna 337 'Bodacious' was one of the few that could do it, they asked if I was interested in coming down? I would be there for four weeks. They would pay me handsomely, put me up in a nice hotel, pay all my expenses and let me airline home on the weekends. I could attend gala parties, meet wonderful people and see the whole island, up close. It would be an experience I would never forget. What, I wondered, was wrong with this picture? I dithered. I didn't understand what an airshow airplane could do to help a politician get elected. It was 2000 miles from home. There was lots of water to fly over. What about maintenance? What about fuel? What about smoke oil? What about snakes? They would send a substantial deposit they said. How substantial, I asked? They told me. I would be there Monday, I told them. I called my old friend Larry, who in our salad days once called me up and asked if I wanted to join the Marine Corps with him. "Sure", I said. Only recently have I begun to forgive him for that. I told him I was flying Bodacious to Puerto Rico to do a month-long series of airshows for a political party. I feared water, snakes and dying, and would he like to go along? "Sure", he said. Charts. We needed charts. A rush order to AOPA produced a foot high stack of graphics and an evening of planning on the kitchen table, punctuated with the rustle of paper and murmurs of "wait, what chart does this join? ", produced a sort of flight plan. We chose the island of Grand Turk as our fuel stop, approximately 400 miles out in the Caribbean and more or less in line with where we were going,. Suddenly it dawned on me, that, we also needed passports. While Puerto Rico is US soil, the same can't be said for the islands dotting the Caribbean. A mad scramble ensued to get the needed documents. By shameless use of a congressman and with Fed Ex's help, the passports arrived in time. The airplane was checked over and fueled and the weather map scrutinized. We were ready. The flight from West Virginia to Fort Lauderdale was routine and the day was almost done when we picked up the inflatable raft and survival kit that we had rented for the flight. We checked in at the local Ramada Inn, had a light supper and turned in early, in order to be sharp for tomorrow's flight. I snapped off the light, then for the next several hours, stared at the ceiling and reviewed the following items: Ditching procedures, survival techniques, lost communication procedures, techniques for finding water on desert islands, communicating with natives via sign language, methods to appear indigestible to cannibals, etc. When I was finished with that, I moved on to a detailed mental critique of the book, 'Looking For Amelia Earhart'. Soon the edge of our window started to lighten and I knew my chance for sleep was over. I was exhausted. I gloomily pulled back the curtain and peered out. Rats! It was IFR. Not only was I going to launch smack into the middle of the Bermuda Triangle, I wouldn't even be able to see anything when I did it. Well no matter, we needed to keep to our schedule if we were to arrive in Puerto Rico on time. Besides, the airplane wouldn't know we were flying into an area that seems to gobble up passing ships and airplanes. It had remained rock solid and dependable, even with the extreme flying of the airshows and I felt it would remain so for this trip. Larry still snoozed. I kicked his bed and bright blue eyes snapped open in a rested face. He happily announced that he'd had a wonderful sleep and couldn't wait to get started. I stared at him dully through my own bloodshot eyes while unkind thoughts muttered and stomped through my mind. The weather, though low IFR at takeoff, slowly moderated and two hours into the flight, we were winging through the bright sunshine of a Bahamian morning. The sea really did have the blue-green look of the travel posters and small islands dotted our path. The water was clear and generally not deep, and occasionally we could see a sunken boat resting on the bottom. Fuel and customs at Grand Turk were uneventful, and late afternoon brought the solid shape of the island of Puerto Rico ghosting through the sea haze. Fernando Dominicci, the general aviation airport for San Juan, is located near the north shore of the island on a narrow spit of land, hard by the wharves where the cruise ships dock. We landed and rolled out, looking around at the numerous and varied aircraft that crowded the single runway. DC-3's, Widgeons and many other transport aircraft were scattered about, and almost every type and make of general aviation aircraft was parked wherever there was room to park. Since we had been on foreign soil at Grand Turk, we asked to taxi to customs, where an inspector regarded the airshow paint on Bodacious with some confusion. We explained our mission as best we could without really understanding it ourselves, and were soon free to join our sponsor, who was there waiting. Until my meeting that afternoon with Antonio Brunet, erstwhile stone quarry executive and behind-the-scene Popular Democratic Party supporter and my financial sponsor, I had lumped all political campaigning into the 'Boring things that I don't want to be around' category. I pictured shiny faced politicians kissing babies and droning through incessant speeches and deadly dull fund raising dinners that should be avoided at all cost. Then I learned about politics, Latin style. 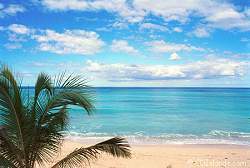 Puerto Rico is an island 100 miles long and 35 miles wide lying roughly east to west with a population of 3.6 million people. Because this dense population was packed into such a small area, I was delighted to learn that the Puerto Ricans had developed a style of campaigning that was anything but boring. During major elections such as this one, everyone on the island seemed to be involved in the campaign in one fashion or another and the elections take on an importance that we never see in the US. Much of the activity centers on the campaign parades they call trains. These trains are made up of many hundreds, perhaps thousands of vehicles that form in a miles-long line, and travel from town to town, as a sort of rolling party. The political candidates ride on the back of huge decorated trucks, waving to the crowds that line the narrow roads. They are flanked by boom trucks with speakers the size of Volkswagens mounted on hydraulic lifts make the earth vibrate with the party music they play. As they pull into the main street of a town the houses empty and there is quite literally dancing in the streets, as a sleeping village turns into an instant party. Vendors are routinely part of the train, so food and drink add to the celebration before the speeches start. The closest I can come to describing my job during this particular campaign, would be to say I was hired to strafe the populace without having to shoot anyone. I would time my arrival over a village or town a half-hour or so before the train was due, and proceed to empty every house in town. This was accomplished by multiple screaming, smoke trailing passes at 200 mile per hour over the rooftops at an altitude just sufficient to avoid collecting TV antenna. How could I be getting paid for this, I wondered? If only they had known, I would have done it for nothing.. Since the capacity of my smoke oil tank was only 7 gallons and good for only about 15 minutes of mosquito killing, Larry and I developed a method of transferring smoke oil from 5 gallon tins to the tank, using a Wal-Mart battery powered pump. Larry would crouch in the rear of the cabin facing the rear of the airplane and pump the oil from the tins to the smoke oil tank, while I yanked and banked through the hot bumpy air. I secretly thought if it were me back there I would last only a little while before losing my breakfast, but Larry never seemed notice the discomfort. It served to give us a killer smoke system and enabled us to turn the sunniest village IFR in short order.